Dinner rolls and sweet potatoes. Something so small made me a tad melancholy this morning. I was going over my grocery list for Thanksgiving and I added rolls. 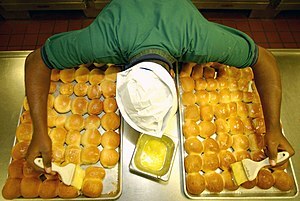 But I was sad because what I really wanted was my Great Uncle Rufus’ homemade dinner rolls for Thanksgiving dinner, not some generic store bought ones. His were phenomenal. He’d make them over the course of a couple of days. I don’t know why and I have no recipe. And even if I did, there’s no guarantee I’d be able to replicate them exactly. He also made fabulous sweet potatoes. They weren’t fancy or anything, just perfection. There are a lot of recipes that are lost to me because family members have died. Uncle Rufus’ little sister Emily was also a fantastic cook. I’ve try to make fried pies and pork chops like her’s, but they aren’t even close to the stratosphere she was working in. Then there are the recipes I have managed to get before someone dies. My mother gave me her cucumber and tomato salad recipe, but I still can’t get it to taste as good as her version. So of course I make her make it when she arrives. Bad daughter. Note: This image, although not mine, is a great coincidence. My Uncle Rufus was a Navy man who served as a cook on his ship during World War II. And, like the guy shown, he lived in Indianapolis, Indiana for the majority of his adult life.